There's an indoor restaurant that is fully air-conditioned, but these "papags" looks so inviting! It even comes with two triangular pillows. 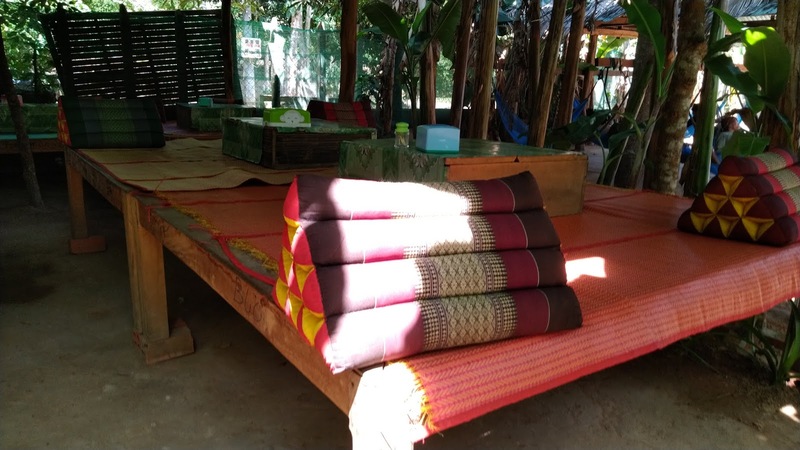 Each "papag" has a dedicated electric fan to beat the famous scorching heat of Siem Reap. 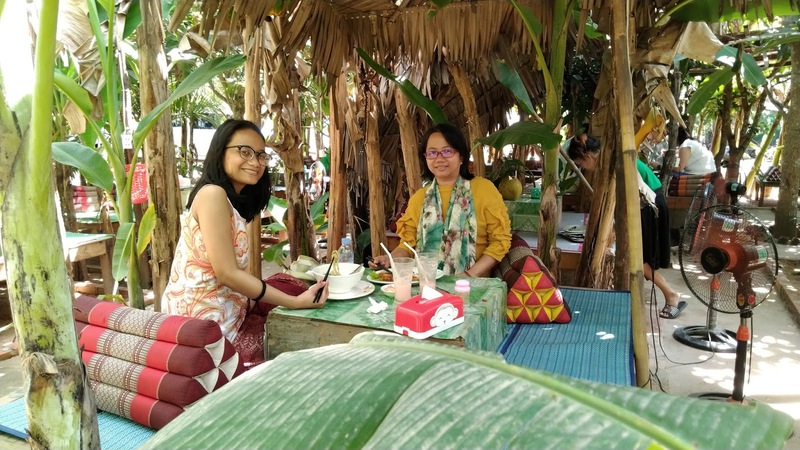 Our companions opted to dine inside the air-conditioned area while my daughter and I opted to dine al fresco. And it was a wise decision also since we were able to remove our shoes, stretch our legs, and wiggle our toes. Too much walking around the temple can literally make your legs stiff and your whole body ache. We ordered watermelon shake as soon as we sat down. It was really hot so we need something to cool us down. 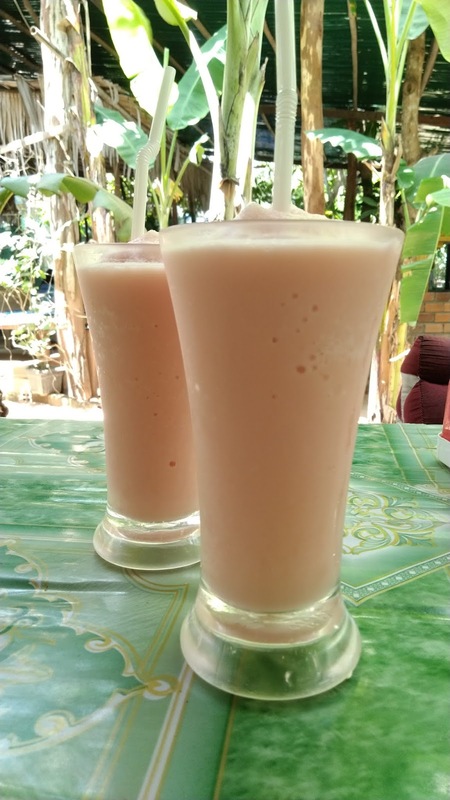 If you noticed the pale pink color of the drink, it is because the fruit shake has milk in it. I was a bit apprehensive to drink it because it might not agree with the hot/humid weather but I guess I can always run to the loo! Hahaha. It tastes refreshing although the milk seem to overpower the watermelon. Think of it as watermelon flavored milk shake. But we liked it because it gave us the much needed energy. These costs $2 each. Do take note that the preferred currency in Siem Reap is American dollars. 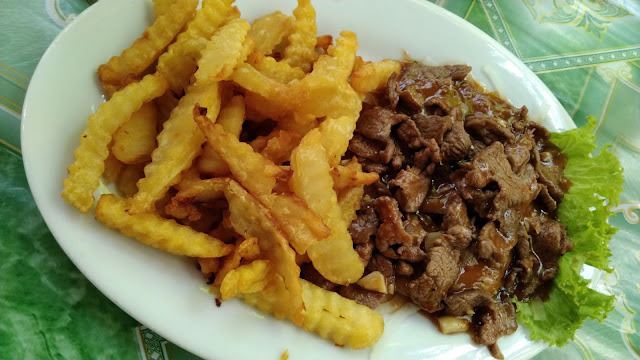 My daughter's craving for meat so she ordered Beef Lok Lak. This is a traditional Khmer dish that is similar to Beef in Oyster Sauce. Of course, beef pairs well with potatoes. Very filling meal, good for sharing. 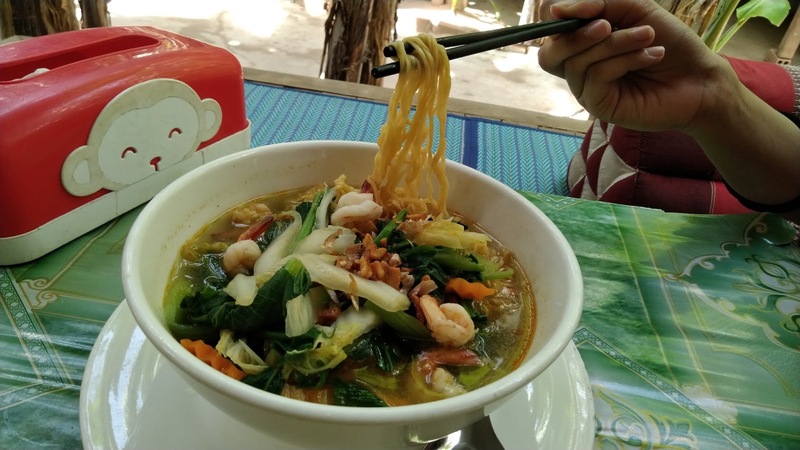 I know it is a hot day but I love noodle soup so I ordered this. Can't remember if they call it Seafood Noodle Soup. And the serving portion is good for two pax also. 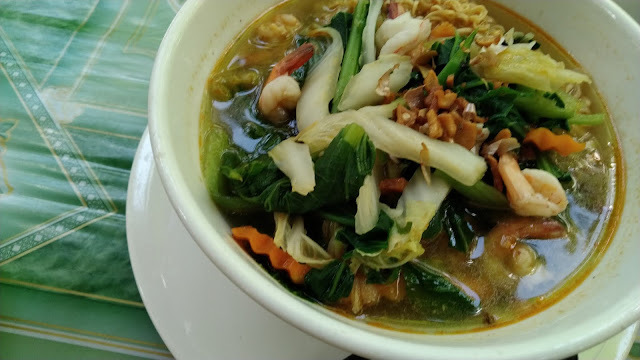 It has familiar vegetables like pechay, carrots, and celery. The noodles are cooked al dente, yey! You can ask for some lime or chili sauce to add to the soup. Yum! I can't remember the price of the Beef Lok Lak and the Seafood Noodle Soup but I think we paid around $18 for everything. 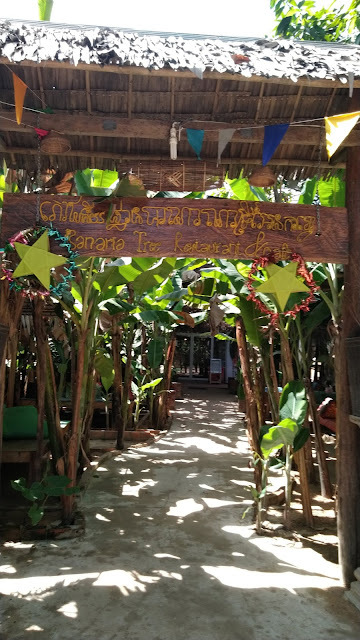 Quite expensive if you compare the prices in Pub Street area but Banana Tree is one of the few restaurants inside the Angkor Wat temple complex and it is only open during temple tour hours. Overall, we really had a nice meal. We also got to rest while laying down on the cool "papag." We even saw someone asleep on his "papag." It was a very nice experience to dine outdoors, and in "papags." To take a nap (okay, we just closed our eyes for a bit while waiting our food) under the banana trees. Btw, I'm not really sure if what we're sitting on can be called "papag." Do correct me if I'm wrong because I can't seem to find the perfect term for it. I wanted to call it a daybed but it's too big for a daybed. 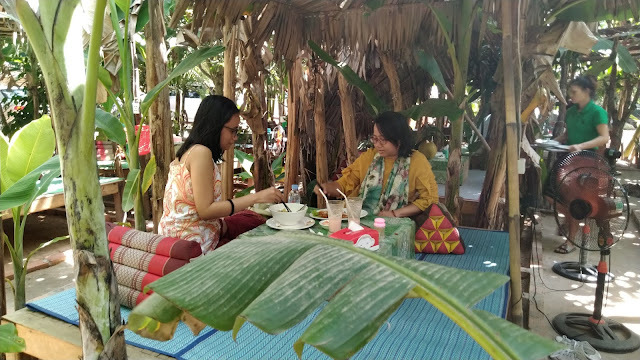 We're still scheduled to visit Ta Keo Temple after our lunch but you know what happens when your tummy suddenly became full of food. Hahaha. Oink oinks, that's us. We all opted to return to our hotel and enjoy the cool air-conditioned room.